Application: Widely used for Boilers, Refrigeration Industry Ventilation Duct, Environment monitor, Navigation Measurement, Weather Forecast & Fire Department. A) Air Velocity : m/s, km/h, ft/min, knots, mph. Display : LCD Display with bar graph Indication. Max, Min & Average Testing Value. Auto Power Off : After 10 minutes from last key operation. Operating Temperature & Humidity : 0℃-40℃, 45% to 80% RH. Storage Temperature & Humidity : -20℃-60℃, 45% to 80% RH. Power Supply : 1pc X 9 Volt Battery. Display Size : 40 X 30 mm. Accessories : Instruction Manual, Carrying Case. 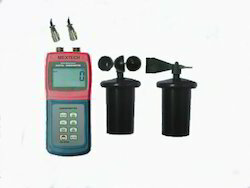 We are offering an excellent quality of Digital Anemometer AM4836C. It is widely used in data collection for boiler, refrigeration industry, ventilation duct, environment monitor, navigation measurement, weather forecast, collection of the weather datum for outdoor busywork and fire department. 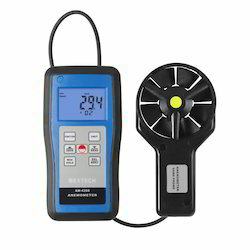 This Digital Anemometer is highly appreciated for its superior quality and accurate results. Moreover, we offer Digital Anemometer at market leading prices.